Are you ready to give your backyard a makeover with a new swimming pool and spa? Today, luxurious outdoor living spaces are in great demand, especially in South Florida. You can vastly improve the market value and desirability of your Wellington home by upgrading your home with new pool and spa. It’s like having your own private resort right outside your back door. Treasure Pools and Services, the premiere builders of Wellington new pools and spas has perfected the art and design of outdoor living. Let them help you incorporate state-of-the-art water features, outdoor kitchen facilities, landscaping and lighting to create your personal paradise. Work with the best Wellington pool builder to ensure that your project is completed on time and on budget. Treasure Pools and Services has earned an A+ Rating with the Better Business Bureau, so you can be sure that you will be working with outstanding professional pool contractors you can count on to do the job right. 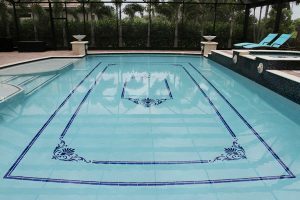 With over 30 years of pool design and construction experience, many homeowners in the residential communities of Olympia, Lake Field South, Sugar Pond Manor, Black Diamond, Oakmont Estates, and Castinvale have trusted Treasure Pools and Services to design and build custom Wellington new pools and spas. Pool remodeling and resurfacing, deck and patio construction, as well as landscaping and lighting, are also available. Don’t wait for someday. Call (561) 793-1550 today for a consultation and you could soon be enjoying your own Wellington new pool and spa. . Treasure Pools and Services also has special financing and pay-as-you-go plans for qualified homeowners to make getting your new pool and spa even easier.